The shapes of the first five atomic orbitals are: 1s, 2s, 2px, 2py, and 2pz. The two colors show the phase or sign of the wave function in each region. These are graphs of ψ(x, y, z) functions which depend on the coordinates of one electron. To see the elongated shape of ψ(x, y, z)2 functions that show probability density more directly, see the graphs of d-orbitals below. In atomic theory and quantum mechanics, an atomic orbital is a mathematical function that describes the wave-like behavior of either one electron or a pair of electrons in an atom. This function can be used to calculate the probability of finding any electron of an atom in any specific region around the atom's nucleus. The term atomic orbital may also refer to the physical region or space where the electron can be calculated to be present, as defined by the particular mathematical form of the orbital. Each orbital in an atom is characterized by a unique set of values of the three quantum numbers n, ℓ, and m, which respectively correspond to the electron's energy, angular momentum, and an angular momentum vector component (the magnetic quantum number). Each such orbital can be occupied by a maximum of two electrons, each with its own spin quantum number s. The simple names s orbital, p orbital, d orbital and f orbital refer to orbitals with angular momentum quantum number ℓ = 0, 1, 2 and 3 respectively. These names, together with the value of n, are used to describe the electron configurations of atoms. They are derived from the description by early spectroscopists of certain series of alkali metal spectroscopic lines as sharp, principal, diffuse, and fundamental. Orbitals for ℓ > 3 continue alphabetically, omitting j (g, h, i, k, ...) because some languages do not distinguish between the letters "i" and "j". Atomic orbitals are the basic building blocks of the atomic orbital model (alternatively known as the electron cloud or wave mechanics model), a modern framework for visualizing the submicroscopic behavior of electrons in matter. In this model the electron cloud of a multi-electron atom may be seen as being built up (in approximation) in an electron configuration that is a product of simpler hydrogen-like atomic orbitals. The repeating periodicity of the blocks of 2, 6, 10, and 14 elements within sections of the periodic table arises naturally from the total number of electrons that occupy a complete set of s, p, d and f atomic orbitals, respectively, although for higher values of the quantum number n, particularly when the atom in question bears a positive charge, the energies of certain sub-shells become very similar and so the order in which they are said to be populated by electrons (e.g. Cr = [Ar]4s13d5 and Cr2+ = [Ar]3d4) can only be rationalized somewhat arbitrarily. Atomic orbitals of the electron in a hydrogen atom at different energy levels. The probability of finding the electron is given by the color, as shown in the key at upper right. The electrons do not orbit the nucleus in the manner of a planet orbiting the sun, but instead exist as standing waves. Thus the lowest possible energy an electron can take is similar to the fundamental frequency of a wave on a string. Higher energy states are similar to harmonics of that fundamental frequency. The electrons are never in a single point location, although the probability of interacting with the electron at a single point can be found from the wave function of the electron. The charge on the electron acts like it is smeared out in space in a continuous distribution, proportional at any point to the squared magnitude of the electron's wave function. The number of electrons orbiting the nucleus can only be an integer. Electrons jump between orbitals like particles. For example, if a single photon strikes the electrons, only a single electron changes states in response to the photon. The electrons retain particle-like properties such as: each wave state has the same electrical charge as its electron particle. Each wave state has a single discrete spin (spin up or spin down) depending on its superposition. Thus, despite the popular analogy to planets revolving around the Sun, electrons cannot be described simply as solid particles. In addition, atomic orbitals do not closely resemble a planet's elliptical path in ordinary atoms. A more accurate analogy might be that of a large and often oddly shaped "atmosphere" (the electron), distributed around a relatively tiny planet (the atomic nucleus). Atomic orbitals exactly describe the shape of this "atmosphere" only when a single electron is present in an atom. When more electrons are added to a single atom, the additional electrons tend to more evenly fill in a volume of space around the nucleus so that the resulting collection (sometimes termed the atom's "electron cloud") tends toward a generally spherical zone of probability describing the electron's location, because of the uncertainty principle. In atomic physics, the atomic spectral lines correspond to transitions (quantum leaps) between quantum states of an atom. These states are labeled by a set of quantum numbers summarized in the term symbol and usually associated with particular electron configurations, i.e., by occupation schemes of atomic orbitals (for example, 1s2 2s2 2p6 for the ground state of neon—term symbol: 1S0). This notation means that the corresponding Slater determinants have a clear higher weight in the configuration interaction expansion. The atomic orbital concept is therefore a key concept for visualizing the excitation process associated with a given transition. For example, one can say for a given transition that it corresponds to the excitation of an electron from an occupied orbital to a given unoccupied orbital. Nevertheless, one has to keep in mind that electrons are fermions ruled by the Pauli exclusion principle and cannot be distinguished from the other electrons in the atom. Moreover, it sometimes happens that the configuration interaction expansion converges very slowly and that one cannot speak about simple one-determinant wave function at all. This is the case when electron correlation is large. Fundamentally, an atomic orbital is a one-electron wave function, even though most electrons do not exist in one-electron atoms, and so the one-electron view is an approximation. When thinking about orbitals, we are often given an orbital visualization heavily influenced by the Hartree–Fock approximation, which is one way to reduce the complexities of molecular orbital theory. The hydrogen-like atomic orbitals are derived from the exact solution of the Schrödinger Equation for one electron and a nucleus, for a hydrogen-like atom. The part of the function that depends on the distance r from the nucleus has nodes (radial nodes) and decays as e−(constant × distance). The Slater-type orbital (STO) is a form without radial nodes but decays from the nucleus as does the hydrogen-like orbital. Although hydrogen-like orbitals are still used as pedagogical tools, the advent of computers has made STOs preferable for atoms and diatomic molecules since combinations of STOs can replace the nodes in hydrogen-like atomic orbital. Gaussians are typically used in molecules with three or more atoms. Although not as accurate by themselves as STOs, combinations of many Gaussians can attain the accuracy of hydrogen-like orbitals. The term "orbital" was coined by Robert Mulliken in 1932 as an abbreviation for one-electron orbital wave function. However, the idea that electrons might revolve around a compact nucleus with definite angular momentum was convincingly argued at least 19 years earlier by Niels Bohr, and the Japanese physicist Hantaro Nagaoka published an orbit-based hypothesis for electronic behavior as early as 1904. Explaining the behavior of these electron "orbits" was one of the driving forces behind the development of quantum mechanics. With J. J. Thomson's discovery of the electron in 1897, it became clear that atoms were not the smallest building blocks of nature, but were rather composite particles. The newly discovered structure within atoms tempted many to imagine how the atom's constituent parts might interact with each other. Thomson theorized that multiple electrons revolved in orbit-like rings within a positively charged jelly-like substance, and between the electron's discovery and 1909, this "plum pudding model" was the most widely accepted explanation of atomic structure. Shortly after Thomson's discovery, Hantaro Nagaoka predicted a different model for electronic structure. 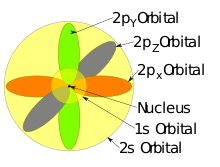 Unlike the plum pudding model, the positive charge in Nagaoka's "Saturnian Model" was concentrated into a central core, pulling the electrons into circular orbits reminiscent of Saturn's rings. Few people took notice of Nagaoka's work at the time, and Nagaoka himself recognized a fundamental defect in the theory even at its conception, namely that a classical charged object cannot sustain orbital motion because it is accelerating and therefore loses energy due to electromagnetic radiation. Nevertheless, the Saturnian model turned out to have more in common with modern theory than any of its contemporaries. In 1909, Ernest Rutherford discovered that the bulk of the atomic mass was tightly condensed into a nucleus, which was also found to be positively charged. It became clear from his analysis in 1911 that the plum pudding model could not explain atomic structure. In 1913 as Rutherford's post-doctoral student, Niels Bohr proposed a new model of the atom, wherein electrons orbited the nucleus with classical periods, but were only permitted to have discrete values of angular momentum, quantized in units h/2π. This constraint automatically permitted only certain values of electron energies. The Bohr model of the atom fixed the problem of energy loss from radiation from a ground state (by declaring that there was no state below this), and more importantly explained the origin of spectral lines. The Rutherford–Bohr model of the hydrogen atom. After Bohr's use of Einstein's explanation of the photoelectric effect to relate energy levels in atoms with the wavelength of emitted light, the connection between the structure of electrons in atoms and the emission and absorption spectra of atoms became an increasingly useful tool in the understanding of electrons in atoms. The most prominent feature of emission and absorption spectra (known experimentally since the middle of the 19th century), was that these atomic spectra contained discrete lines. The significance of the Bohr model was that it related the lines in emission and absorption spectra to the energy differences between the orbits that electrons could take around an atom. This was, however, not achieved by Bohr through giving the electrons some kind of wave-like properties, since the idea that electrons could behave as matter waves was not suggested until eleven years later. Still, the Bohr model's use of quantized angular momenta and therefore quantized energy levels was a significant step towards the understanding of electrons in atoms, and also a significant step towards the development of quantum mechanics in suggesting that quantized restraints must account for all discontinuous energy levels and spectra in atoms. With de Broglie's suggestion of the existence of electron matter waves in 1924, and for a short time before the full 1926 Schrödinger equation treatment of hydrogen-like atom, a Bohr electron "wavelength" could be seen to be a function of its momentum, and thus a Bohr orbiting electron was seen to orbit in a circle at a multiple of its half-wavelength (this physically incorrect Bohr model is still often taught to beginning students). The Bohr model for a short time could be seen as a classical model with an additional constraint provided by the 'wavelength' argument. However, this period was immediately superseded by the full three-dimensional wave mechanics of 1926. In our current understanding of physics, the Bohr model is called a semi-classical model because of its quantization of angular momentum, not primarily because of its relationship with electron wavelength, which appeared in hindsight a dozen years after the Bohr model was proposed. The Bohr model was able to explain the emission and absorption spectra of hydrogen. The energies of electrons in the n = 1, 2, 3, etc. states in the Bohr model match those of current physics. However, this did not explain similarities between different atoms, as expressed by the periodic table, such as the fact that helium (two electrons), neon (10 electrons), and argon (18 electrons) exhibit similar chemical inertness. Modern quantum mechanics explains this in terms of electron shells and subshells which can each hold a number of electrons determined by the Pauli exclusion principle. Thus the n = 1 state can hold one or two electrons, while the n = 2 state can hold up to eight electrons in 2s and 2p subshells. In helium, all n = 1 states are fully occupied; the same for n = 1 and n = 2 in neon. In argon the 3s and 3p subshells are similarly fully occupied by eight electrons; quantum mechanics also allows a 3d subshell but this is at higher energy than the 3s and 3p in argon (contrary to the situation in the hydrogen atom) and remains empty. Immediately after Heisenberg discovered his uncertainty principle, Bohr noted that the existence of any sort of wave packet implies uncertainty in the wave frequency and wavelength, since a spread of frequencies is needed to create the packet itself. In quantum mechanics, where all particle momenta are associated with waves, it is the formation of such a wave packet which localizes the wave, and thus the particle, in space. In states where a quantum mechanical particle is bound, it must be localized as a wave packet, and the existence of the packet and its minimum size implies a spread and minimal value in particle wavelength, and thus also momentum and energy. In quantum mechanics, as a particle is localized to a smaller region in space, the associated compressed wave packet requires a larger and larger range of momenta, and thus larger kinetic energy. Thus the binding energy to contain or trap a particle in a smaller region of space increases without bound as the region of space grows smaller. Particles cannot be restricted to a geometric point in space, since this would require an infinite particle momentum. In chemistry, Schrödinger, Pauling, Mulliken and others noted that the consequence of Heisenberg's relation was that the electron, as a wave packet, could not be considered to have an exact location in its orbital. Max Born suggested that the electron's position needed to be described by a probability distribution which was connected with finding the electron at some point in the wave-function which described its associated wave packet. The new quantum mechanics did not give exact results, but only the probabilities for the occurrence of a variety of possible such results. Heisenberg held that the path of a moving particle has no meaning if we cannot observe it, as we cannot with electrons in an atom. where X is the energy level corresponding to the principal quantum number n; type is a lower-case letter denoting the shape or subshell of the orbital, corresponding to the angular quantum number ℓ; and y is the number of electrons in that orbital. For example, the orbital 1s2 (pronounced as the individual numbers and letters: "one ess two") has two electrons and is the lowest energy level (n = 1) and has an angular quantum number of ℓ = 0, denoted as s.
There is also another, less common system still used in X-ray science known as X-ray notation, which is a continuation of the notations used before orbital theory was well understood. In this system, the principal quantum number is given a letter associated with it. For n = 1, 2, 3, 4, 5, …, the letters associated with those numbers are K, L, M, N, O, ... respectively. The simplest atomic orbitals are those that are calculated for systems with a single electron, such as the hydrogen atom. An atom of any other element ionized down to a single electron is very similar to hydrogen, and the orbitals take the same form. In the Schrödinger equation for this system of one negative and one positive particle, the atomic orbitals are the eigenstates of the Hamiltonian operator for the energy. They can be obtained analytically, meaning that the resulting orbitals are products of a polynomial series, and exponential and trigonometric functions. (see hydrogen atom). For atoms with two or more electrons, the governing equations can only be solved with the use of methods of iterative approximation. Orbitals of multi-electron atoms are qualitatively similar to those of hydrogen, and in the simplest models, they are taken to have the same form. For more rigorous and precise analysis, numerical approximations must be used. A given (hydrogen-like) atomic orbital is identified by unique values of three quantum numbers: n, ℓ, and mℓ. The rules restricting the values of the quantum numbers, and their energies (see below), explain the electron configuration of the atoms and the periodic table. The stationary states (quantum states) of the hydrogen-like atoms are its atomic orbitals. [clarification needed] However, in general, an electron's behavior is not fully described by a single orbital. Electron states are best represented by time-depending "mixtures" (linear combinations) of multiple orbitals. See Linear combination of atomic orbitals molecular orbital method. The quantum number n first appeared in the Bohr model where it determines the radius of each circular electron orbit. In modern quantum mechanics however, n determines the mean distance of the electron from the nucleus; all electrons with the same value of n lie at the same average distance. For this reason, orbitals with the same value of n are said to comprise a "shell". Orbitals with the same value of n and also the same value of ℓ are even more closely related, and are said to comprise a "subshell". Because of the quantum mechanical nature of the electrons around a nucleus, atomic orbitals can be uniquely defined by a set of integers known as quantum numbers. These quantum numbers only occur in certain combinations of values, and their physical interpretation changes depending on whether real or complex versions of the atomic orbitals are employed. The principal quantum number n describes the energy of the electron and is always a positive integer. In fact, it can be any positive integer, but for reasons discussed below, large numbers are seldom encountered. Each atom has, in general, many orbitals associated with each value of n; these orbitals together are sometimes called electron shells.
. The set of orbitals associated with a particular value of ℓ are sometimes collectively called a subshell. available in that subshell. Empty cells represent subshells that do not exist. Each electron also has a spin quantum number, s, which describes the spin of each electron (spin up or spin down). The number s can be +1/2 or −1/2. The Pauli exclusion principle states that no two electrons in an atom can have the same values of all four quantum numbers. If there are two electrons in an orbital with given values for three quantum numbers, (n, l, m), these two electrons must differ in their spin. The above conventions imply a preferred axis (for example, the z direction in Cartesian coordinates), and they also imply a preferred direction along this preferred axis. Otherwise there would be no sense in distinguishing m = +1 from m = −1. As such, the model is most useful when applied to physical systems that share these symmetries. The Stern–Gerlach experiment — where an atom is exposed to a magnetic field — provides one such example. An atom that is embedded in a crystalline solid feels multiple preferred axes, but often no preferred direction. Instead of building atomic orbitals out of the product of radial functions and a single spherical harmonic, linear combinations of spherical harmonics are typically used, designed so that the imaginary part of the spherical harmonics cancel out. These real orbitals are the building blocks most commonly shown in orbital visualizations. where p0 = Rn 1 Y1 0, p1 = Rn 1 Y1 1, and p−1 = Rn 1 Y1 −1, are the complex orbitals corresponding to ℓ = 1.
. However some quantum physicists include a phase factor (-1)m in these definitions, which has the effect of relating the px orbital to a difference of spherical harmonics and the py orbital to the corresponding sum. (For more detail, see Spherical harmonics#Conventions). Transparent cloud view of a computed 6s (n = 6, ℓ = 0, m = 0) hydrogen atom orbital. The s orbitals, though spherically symmetrical, have radially placed wave-nodes for n > 1. Only s orbitals invariably have a center anti-node; the other types never do. Simple pictures showing orbital shapes are intended to describe the angular forms of regions in space where the electrons occupying the orbital are likely to be found. The diagrams cannot show the entire region where an electron can be found, since according to quantum mechanics there is a non-zero probability of finding the electron (almost) anywhere in space. Instead the diagrams are approximate representations of boundary or contour surfaces where the probability density | ψ(r, θ, φ) |2 has a constant value, chosen so that there is a certain probability (for example 90%) of finding the electron within the contour. Although | ψ |2 as the square of an absolute value is everywhere non-negative, the sign of the wave function ψ(r, θ, φ) is often indicated in each subregion of the orbital picture. Sometimes the ψ function will be graphed to show its phases, rather than the | ψ(r, θ, φ) |2 which shows probability density but has no phases (which have been lost in the process of taking the absolute value, since ψ(r, θ, φ) is a complex number). | ψ(r, θ, φ) |2 orbital graphs tend to have less spherical, thinner lobes than ψ(r, θ, φ) graphs, but have the same number of lobes in the same places, and otherwise are recognizable. This article, in order to show wave function phases, shows mostly ψ(r, θ, φ) graphs. The lobes can be viewed as standing wave interference patterns between the two counter rotating, ring resonant travelling wave "m" and "−m" modes, with the projection of the orbital onto the xy plane having a resonant "m" wavelengths around the circumference. Though rarely depicted the travelling wave solutions can be viewed as rotating banded tori, with the bands representing phase information. For each m there are two standing wave solutions ⟨m⟩+⟨−m⟩ and ⟨m⟩−⟨−m⟩. For the case where m = 0 the orbital is vertical, counter rotating information is unknown, and the orbital is z-axis symmetric. For the case where ℓ = 0 there are no counter rotating modes. There are only radial modes and the shape is spherically symmetric. For any given n, the smaller ℓ is, the more radial nodes there are. Loosely speaking n is energy, ℓ is analogous to eccentricity, and m is orientation. In the classical case, a ring resonant travelling wave, for example in a circular transmission line, unless actively forced, will spontaneously decay into a ring resonant standing wave because reflections will build up over time at even the smallest imperfection or discontinuity. Generally speaking, the number n determines the size and energy of the orbital for a given nucleus: as n increases, the size of the orbital increases. When comparing different elements, the higher nuclear charge Z of heavier elements causes their orbitals to contract by comparison to lighter ones, so that the overall size of the whole atom remains very roughly constant, even as the number of electrons in heavier elements (higher Z) increases. 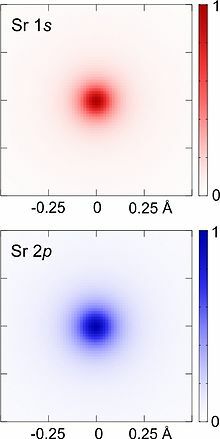 Experimentally imaged 1s and 2p core-electron orbitals of Sr, including the effects of atomic thermal vibrations and excitation broadening, retrieved from energy dispersive x-ray spectroscopy (EDX) in scanning transmission electron microscopy (STEM). Also in general terms, ℓ determines an orbital's shape, and mℓ its orientation. However, since some orbitals are described by equations in complex numbers, the shape sometimes depends on mℓ also. Together, the whole set of orbitals for a given ℓ and n fill space as symmetrically as possible, though with increasingly complex sets of lobes and nodes.
) are shaped like spheres. For n = 1 it is roughly a solid ball (it is most dense at the center and fades exponentially outwardly), but for n = 2 or more, each single s-orbital is composed of spherically symmetric surfaces which are nested shells (i.e., the "wave-structure" is radial, following a sinusoidal radial component as well). See illustration of a cross-section of these nested shells, at right. The s-orbitals for all n numbers are the only orbitals with an anti-node (a region of high wave function density) at the center of the nucleus. All other orbitals (p, d, f, etc.) have angular momentum, and thus avoid the nucleus (having a wave node at the nucleus). Recently, there has been an effort to experimentally image the 1s and 2p orbitials in a SrTiO3 crystal using scanning transmission electron microscopy with energy dispersive x-ray spectroscopy. Because the imaging was conducted using an electron beam, Coulombic beam-orbital interaction that is often termed as the impact parameter effect is included in the final outcome (see the figure at right). The shapes of p, d and f-orbitals are described verbally here and shown graphically in the Orbitals table below. The three p-orbitals for n = 2 have the form of two ellipsoids with a point of tangency at the nucleus (the two-lobed shape is sometimes referred to as a "dumbbell"—there are two lobes pointing in opposite directions from each other). The three p-orbitals in each shell are oriented at right angles to each other, as determined by their respective linear combination of values of mℓ. The overall result is a lobe pointing along each direction of the primary axes. Four of the five d-orbitals for n = 3 look similar, each with four pear-shaped lobes, each lobe tangent at right angles to two others, and the centers of all four lying in one plane. Three of these planes are the xy-, xz-, and yz-planes—the lobes are between the pairs of primary axes—and the fourth has the centres along the x and y axes themselves. The fifth and final d-orbital consists of three regions of high probability density: a torus with two pear-shaped regions placed symmetrically on its z axis. The overall total of 18 directional lobes point in every primary axis direction and between every pair. There are seven f-orbitals, each with shapes more complex than those of the d-orbitals. Additionally, as is the case with the s orbitals, individual p, d, f and g orbitals with n values higher than the lowest possible value, exhibit an additional radial node structure which is reminiscent of harmonic waves of the same type, as compared with the lowest (or fundamental) mode of the wave. As with s orbitals, this phenomenon provides p, d, f, and g orbitals at the next higher possible value of n (for example, 3p orbitals vs. the fundamental 2p), an additional node in each lobe. Still higher values of n further increase the number of radial nodes, for each type of orbital. The shapes of atomic orbitals in one-electron atom are related to 3-dimensional spherical harmonics. These shapes are not unique, and any linear combination is valid, like a transformation to cubic harmonics, in fact it is possible to generate sets where all the d's are the same shape, just like the px, py, and pz are the same shape. The 1s, 2s, & 2p orbitals of a sodium atom. Although individual orbitals are most often shown independent of each other, the orbitals coexist around the nucleus at the same time. Also, in 1927, Albrecht Unsöld proved that if one sums the electron density of all orbitals of a particular azimuthal quantum number ℓ of the same shell n (e.g. 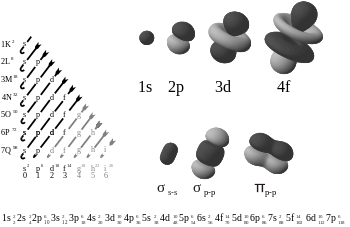 all three 2p orbitals, or all five 3d orbitals) where each orbital is occupied by an electron or each is occupied by an electron pair, then all angular dependence disappears; that is, the resulting total density of all the atomic orbitals in that subshell (those with the same ℓ) is spherical. This is known as Unsöld's theorem. This table shows all orbital configurations for the real hydrogen-like wave functions up to 7s, and therefore covers the simple electronic configuration for all elements in the periodic table up to radium. "ψ" graphs are shown with − and + wave function phases shown in two different colors (arbitrarily red and blue). The pz orbital is the same as the p0 orbital, but the px and py are formed by taking linear combinations of the p+1 and p−1 orbitals (which is why they are listed under the m = ±1 label). Also, the p+1 and p−1 are not the same shape as the p0, since they are pure spherical harmonics. The shapes of atomic orbitals can be qualitatively understood by considering the analogous case of standing waves on a circular drum. To see the analogy, the mean vibrational displacement of each bit of drum membrane from the equilibrium point over many cycles (a measure of average drum membrane velocity and momentum at that point) must be considered relative to that point's distance from the center of the drum head. If this displacement is taken as being analogous to the probability of finding an electron at a given distance from the nucleus, then it will be seen that the many modes of the vibrating disk form patterns that trace the various shapes of atomic orbitals. The basic reason for this correspondence lies in the fact that the distribution of kinetic energy and momentum in a matter-wave is predictive of where the particle associated with the wave will be. That is, the probability of finding an electron at a given place is also a function of the electron's average momentum at that point, since high electron momentum at a given position tends to "localize" the electron in that position, via the properties of electron wave-packets (see the Heisenberg uncertainty principle for details of the mechanism). This relationship means that certain key features can be observed in both drum membrane modes and atomic orbitals. For example, in all of the modes analogous to s orbitals (the top row in the animated illustration below), it can be seen that the very center of the drum membrane vibrates most strongly, corresponding to the antinode in all s orbitals in an atom. This antinode means the electron is most likely to be at the physical position of the nucleus (which it passes straight through without scattering or striking it), since it is moving (on average) most rapidly at that point, giving it maximal momentum. A mental "planetary orbit" picture closest to the behavior of electrons in s orbitals, all of which have no angular momentum, might perhaps be that of a Keplerian orbit with the orbital eccentricity of 1 but a finite major axis, not physically possible (because particles were to collide), but can be imagined as a limit of orbits with equal major axes but increasing eccentricity. Below, a number of drum membrane vibration modes and the respective wave functions of the hydrogen atom are shown. A correspondence can be considered where the wave functions of a vibrating drum head are for a two-coordinate system ψ(r, θ) and the wave functions for a vibrating sphere are three-coordinate ψ(r, θ, φ). None of the other sets of modes in a drum membrane have a central antinode, and in all of them the center of the drum does not move. These correspond to a node at the nucleus for all non-s orbitals in an atom. These orbitals all have some angular momentum, and in the planetary model, they correspond to particles in orbit with eccentricity less than 1.0, so that they do not pass straight through the center of the primary body, but keep somewhat away from it. In addition, the drum modes analogous to p and d modes in an atom show spatial irregularity along the different radial directions from the center of the drum, whereas all of the modes analogous to s modes are perfectly symmetrical in radial direction. The non radial-symmetry properties of non-s orbitals are necessary to localize a particle with angular momentum and a wave nature in an orbital where it must tend to stay away from the central attraction force, since any particle localized at the point of central attraction could have no angular momentum. For these modes, waves in the drum head tend to avoid the central point. Such features again emphasize that the shapes of atomic orbitals are a direct consequence of the wave nature of electrons. are degenerate in the Schrödinger approximation, and have the same energy. This approximation is broken to a slight extent in the solution to the Dirac equation (where the energy depends on n and another quantum number j), and by the effect of the magnetic field of the nucleus and quantum electrodynamics effects. The latter induce tiny binding energy differences especially for s electrons that go nearer the nucleus, since these feel a very slightly different nuclear charge, even in one-electron atoms; see Lamb shift. the energy is pushed into the shell two steps higher. The filling of the 3d orbitals does not occur until the 4s orbitals have been filled. of electrons becomes less and less important in their energy placement. given by its row and column indices, respectively. The number in the cell is the subshell's position in the sequence. For a linear listing of the subshells in terms of increasing energies in multielectron atoms, see the section below. Note: empty cells indicate non-existent sublevels, while numbers in italics indicate sublevels that could (potentially) exist, but which do not hold electrons in any element currently known. Electron atomic and molecular orbitals. The chart of orbitals (left) is arranged by increasing energy (see Madelung rule). Note that atomic orbits are functions of three variables (two angles, and the distance r from the nucleus). These images are faithful to the angular component of the orbital, but not entirely representative of the orbital as a whole. Several rules govern the placement of electrons in orbitals (electron configuration). The first dictates that no two electrons in an atom may have the same set of values of quantum numbers (this is the Pauli exclusion principle). These quantum numbers include the three that define orbitals, as well as s, or spin quantum number. Thus, two electrons may occupy a single orbital, so long as they have different values of s. However, only two electrons, because of their spin, can be associated with each orbital. Additionally, an electron always tends to fall to the lowest possible energy state. It is possible for it to occupy any orbital so long as it does not violate the Pauli exclusion principle, but if lower-energy orbitals are available, this condition is unstable. The electron will eventually lose energy (by releasing a photon) and drop into the lower orbital. Thus, electrons fill orbitals in the order specified by the energy sequence given above. This behavior is responsible for the structure of the periodic table. The table may be divided into several rows (called 'periods'), numbered starting with 1 at the top. The presently known elements occupy seven periods. If a certain period has number i, it consists of elements whose outermost electrons fall in the ith shell. Niels Bohr was the first to propose (1923) that the periodicity in the properties of the elements might be explained by the periodic filling of the electron energy levels, resulting in the electronic structure of the atom. The periodic table may also be divided into several numbered rectangular 'blocks'. The elements belonging to a given block have this common feature: their highest-energy electrons all belong to the same ℓ-state (but the n associated with that ℓ-state depends upon the period). For instance, the leftmost two columns constitute the 's-block'. The outermost electrons of Li and Be respectively belong to the 2s subshell, and those of Na and Mg to the 3s subshell. Although this is the general order of orbital filling according to the Madelung rule, there are exceptions, and the actual electronic energies of each element are also dependent upon additional details of the atoms (see Electron configuration#Atoms: Aufbau principle and Madelung rule). The number of electrons in an electrically neutral atom increases with the atomic number. The electrons in the outermost shell, or valence electrons, tend to be responsible for an element's chemical behavior. Elements that contain the same number of valence electrons can be grouped together and display similar chemical properties. For elements with high atomic number Z, the effects of relativity become more pronounced, and especially so for s electrons, which move at relativistic velocities as they penetrate the screening electrons near the core of high-Z atoms. This relativistic increase in momentum for high speed electrons causes a corresponding decrease in wavelength and contraction of 6s orbitals relative to 5d orbitals (by comparison to corresponding s and d electrons in lighter elements in the same column of the periodic table); this results in 6s valence electrons becoming lowered in energy. Examples of significant physical outcomes of this effect include the lowered melting temperature of mercury (which results from 6s electrons not being available for metal bonding) and the golden color of gold and caesium. is oscillatory and unbounded. The significance of element 137, also known as untriseptium, was first pointed out by the physicist Richard Feynman. Element 137 is sometimes informally called feynmanium (symbol Fy). 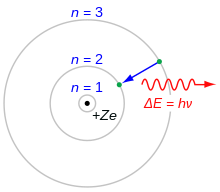 However, Feynman's approximation fails to predict the exact critical value of Z due to the non-point-charge nature of the nucleus and very small orbital radius of inner electrons, resulting in a potential seen by inner electrons which is effectively less than Z. The critical Z value which makes the atom unstable with regard to high-field breakdown of the vacuum and production of electron-positron pairs, does not occur until Z is about 173. These conditions are not seen except transiently in collisions of very heavy nuclei such as lead or uranium in accelerators, where such electron-positron production from these effects has been claimed to be observed. See Extension of the periodic table beyond the seventh period. There are no nodes in relativistic orbital densities, although individual components of the wave function will have nodes. Bound quantum states have discrete energy levels. When applied to atomic orbitals, this means that the energy differences between states are also discrete. A transition between these states (i.e., an electron absorbing or emitting a photon) can thus only happen if the photon has an energy corresponding with the exact energy difference between said states. By quantum theory, state 1 has a fixed energy of E1, and state 2 has a fixed energy of E2. Now, what would happen if an electron in state 1 were to move to state 2? For this to happen, the electron would need to gain an energy of exactly E2 − E1. If the electron receives energy that is less than or greater than this value, it cannot jump from state 1 to state 2. Now, suppose we irradiate the atom with a broad-spectrum of light. Photons that reach the atom that have an energy of exactly E2 − E1 will be absorbed by the electron in state 1, and that electron will jump to state 2. However, photons that are greater or lower in energy cannot be absorbed by the electron, because the electron can only jump to one of the orbitals, it cannot jump to a state between orbitals. The result is that only photons of a specific frequency will be absorbed by the atom. This creates a line in the spectrum, known as an absorption line, which corresponds to the energy difference between states 1 and 2. The atomic orbital model thus predicts line spectra, which are observed experimentally. This is one of the main validations of the atomic orbital model. The atomic orbital model is nevertheless an approximation to the full quantum theory, which only recognizes many electron states. The predictions of line spectra are qualitatively useful but are not quantitatively accurate for atoms and ions other than those containing only one electron. ^ Griffiths, David (1995). Introduction to Quantum Mechanics. Prentice Hall. pp. 190–191. ISBN 978-0-13-124405-4. ^ Levine, Ira (2000). Quantum Chemistry (5 ed.). Prentice Hall. pp. 144–145. ISBN 978-0-13-685512-5. ^ Laidler, Keith J.; Meiser, John H. (1982). Physical Chemistry. Benjamin/Cummings. p. 488. ISBN 978-0-8053-5682-3. ^ Atkins, Peter; de Paula, Julio; Friedman, Ronald (2009). Quanta, Matter, and Change: A Molecular Approach to Physical Chemistry. Oxford University Press. p. 106. ISBN 978-0-19-920606-3. ^ Feynman, Richard; Leighton, Robert B.; Sands, Matthew (2006). The Feynman Lectures on Physics -The Definitive Edition, Vol 1 lect 6. Pearson PLC, Addison Wesley. p. 11. ISBN 978-0-8053-9046-9. ^ Mulliken, Robert S. (July 1932). "Electronic Structures of Polyatomic Molecules and Valence. II. General Considerations". Physical Review. 41 (1): 49–71. Bibcode:1932PhRv...41...49M. doi:10.1103/PhysRev.41.49. ^ a b Bohr, Niels (1913). "On the Constitution of Atoms and Molecules". Philosophical Magazine. 26 (1): 476. Bibcode:1914Natur..93..268N. doi:10.1038/093268a0. ^ a b Nagaoka, Hantaro (May 1904). "Kinetics of a System of Particles illustrating the Line and the Band Spectrum and the Phenomena of Radioactivity". Philosophical Magazine. 7 (41): 445–455. doi:10.1080/14786440409463141. ^ Bryson, Bill (2003). A Short History of Nearly Everything. Broadway Books. pp. 141–143. ISBN 978-0-7679-0818-4. ^ Thomson, J. J. (1897). "Cathode rays". Philosophical Magazine. 44 (269): 293. doi:10.1080/14786449708621070. ^ Thomson, J. J. (1904). "On the Structure of the Atom: an Investigation of the Stability and Periods of Oscillation of a number of Corpuscles arranged at equal intervals around the Circumference of a Circle; with Application of the Results to the Theory of Atomic Structure" (extract of paper). Philosophical Magazine. Series 6. 7 (39): 237–265. doi:10.1080/14786440409463107. ^ Rhodes, Richard (1995). The Making of the Atomic Bomb. Simon & Schuster. pp. 50–51. ISBN 978-0-684-81378-3. ^ Nagaoka, Hantaro (May 1904). "Kinetics of a System of Particles illustrating the Line and the Band Spectrum and the Phenomena of Radioactivity". Philosophical Magazine. 7 (41): 446. doi:10.1080/14786440409463141. ^ Heisenberg, W. (March 1927). "Über den anschaulichen Inhalt der quantentheoretischen Kinematik und Mechanik". Zeitschrift für Physik A. 43 (3–4): 172–198. Bibcode:1927ZPhy...43..172H. doi:10.1007/BF01397280. ^ Bohr, Niels (April 1928). "The Quantum Postulate and the Recent Development of Atomic Theory". Nature. 121 (3050): 580–590. Bibcode:1928Natur.121..580B. doi:10.1038/121580a0. ^ Gerlach, W.; Stern, O. (1922). "Das magnetische Moment des Silberatoms". Zeitschrift für Physik. 9 (1): 353–355. Bibcode:1922ZPhy....9..353G. doi:10.1007/BF01326984. ^ Levine, Ira (2014). Quantum Chemistry (7th ed.). Pearson Education. pp. 141–2. ISBN 978-0-321-80345-0. ^ Blanco, Miguel A.; Flórez, M.; Bermejo, M. (December 1997). "Evaluation of the rotation matrices in the basis of real spherical harmonics". Journal of Molecular Structure: THEOCHEM. 419 (1–3): 19–27. doi:10.1016/S0166-1280(97)00185-1. ^ Messiah, Albert (1999). Quantum mechanics : two volumes bound as one (Two vol. bound as one, unabridged reprint ed.). Mineola, NY: Dover. ISBN 978-0-486-40924-5. ^ Claude Cohen-Tannoudji; Bernard Diu; Franck Laloë; et al. (1996). Quantum mechanics. Translated by from the French by Susan Reid Hemley. Wiley-Interscience. ISBN 978-0-471-56952-7. ^ a b Jeong, Jong Seok; Odlyzko, Michael L.; Xu, Peng; Jalan, Bharat; Mkhoyan, K. Andre (2016-04-26). "Probing core-electron orbitals by scanning transmission electron microscopy and measuring the delocalization of core-level excitations". Physical Review B. 93 (16): 165140. Bibcode:2016PhRvB..93p5140J. doi:10.1103/PhysRevB.93.165140. ^ Powell, Richard E. (1968). "The five equivalent d orbitals". Journal of Chemical Education. 45 (1): 45. Bibcode:1968JChEd..45...45P. doi:10.1021/ed045p45. ^ Kimball, George E. (1940). "Directed Valence". The Journal of Chemical Physics. 8 (2): 188. Bibcode:1940JChPh...8..188K. doi:10.1063/1.1750628. ^ Cazenave, Lions, T., P.; Lions, P. L. (1982). "Orbital stability of standing waves for some nonlinear Schrödinger equations". Communications in Mathematical Physics. 85 (4): 549–561. Bibcode:1982CMaPh..85..549C. doi:10.1007/BF01403504. ^ Bohr, Niels (1923). "Über die Anwendung der Quantumtheorie auf den Atombau. I". Zeitschrift für Physik. 13 (1): 117. Bibcode:1923ZPhy...13..117B. doi:10.1007/BF01328209. ^ Lower, Stephen. "Primer on Quantum Theory of the Atom". ^ Poliakoff, Martyn; Tang, Samantha (9 February 2015). "The periodic table: icon and inspiration". Philosophical Transactions of the Royal Society A. 373 (2037): 20140211. Bibcode:2015RSPTA.37340211P. doi:10.1098/rsta.2014.0211. PMID 25666072. ^ Szabo, Attila (1969). "Contour diagrams for relativistic orbitals". Journal of Chemical Education. 46 (10): 678. Bibcode:1969JChEd..46..678S. doi:10.1021/ed046p678. Tipler, Paul; Llewellyn, Ralph (2003). Modern Physics (4 ed.). New York: W. H. Freeman and Company. ISBN 978-0-7167-4345-3. Levine, Ira (2014). Quantum Chemistry (7th ed.). Pearson Education. ISBN 978-0-321-80345-0. Griffiths, David (2000). Introduction to Quantum Mechanics (2 ed.). Benjamin Cummings. ISBN 978-0-13-111892-8. Cohen, Irwin; Bustard, Thomas (1966). "Atomic Orbitals: Limitations and Variations". J. Chem. Educ. 43 (4): 187. Bibcode:1966JChEd..43..187C. doi:10.1021/ed043p187. Wikimedia Commons has media related to Atomic orbitals.